The current research on Mars is dedicated to discovering evidence of life there. The Mars Curiosity rover is regularly now discovering features of rivers and lakes that flowed vigorously on the surface, while under the surface are reserves of ice, showing clearly on the surface at the great ice caps. Using their DAN neutron bombarder that we have previously shown on the" hip" of the rover, Curiosity's Russian technicians have devised the little diagram above to show how much frozen water they have found so far. Maxim Mokrousov of the Russian Space Research Institute explains, "The prediction based on previous measurements using the Mars Odyssey orbiter was that the soil in Gale Crater would be around 6% water. But the preliminary results from Curiosity show only a fraction of this." It's disappointing, but of course previous distant, low-resolution estimates were unlikely to match these exact and quite variable measurements, taken directly. The reports on Friday of the stream velocities that were possible in Mars' ancient past had us picturing torrents streaming over rapids and great lakes in the summer sun. River gravels have built near Curiosity's wheels over long periods of time, enough perhaps to have swept it away in a flood! William Dietrich of the University of California, Berkeley is of the opinion, "from the size of gravels it carried, we can interpret the water was moving about 3 feet per second, with a depth somewhere between ankle and hip deep." Previous estimates yet again have been trumped by the very reality of these admittedly ancient flows. This is a probable lake site whose name is not taken from its temperature, but a Canadian NWT lake. "Hottah looks like someone jack-hammered up a slab of city sidewalk, but it's really a tilted block of an ancient streambed," explains Mars Science Laboratory Project Scientist John Grotzinger. The alluvial fan that spreads out above this site was evidence that persuaded scientists of the true flows of water in the vicinity. Rounded pebbles in the conglomerate rock show that they were transported for much longer than a few years by the streams of water, over a very long distance (from at least the rim of the Gale crater). 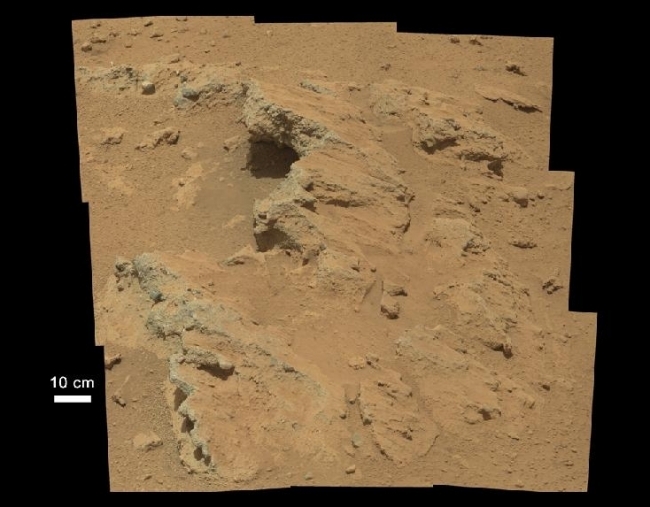 The conglomerate rock is glued together with material that will give clues about the environment within these freshwater streams, but as Curiosity labours toward the distant slopes of Mount Sharp, sulphate and clay chemicals will be likely to reveal enclosed organic compounds from life forms. John Grotzinger is a believer. He reckons the long-flowing stream is a good bet for a habitable niche, because of course, water on Earth can be refuge, home or food source for so many life forms. With superb photography, exact geological analysis and a dose of laser for those elusive chemicals, we are getting curiouser and curiouser.